We are pleased to announce the completion of our two year programme supported by the Heritage Lottery Fund. These aims were not only met but surpassed in many respects. In addition to major exhibitions at The National Justice Museum in Nottingham and at Pickford House (Derby Museum), three travelling exhibitions featuring 46 paintings, a historical display and genealogy panels were held in local libraries, at the Amber Valley Borough Council Office, the Derbyshire Record Office and at community events in Derbyshire and Nottinghamshire. A total of 16 Interpretation Boards have been put up in the towns and villages on the route of the rebels’ march across Derbyshire and Nottinghamshire. The installation of the boards depended on the cooperation and financial support of local parish, town and district councils. These boards are linked to a programme of walks around the various communities associated with the rising. Additionally, three Australian walks were undertaken by members of our group and supporters in the Sydney area in October 2018 to commemorate the arrival of the 14 transported Pentrich rebels in Australia. The commemorative event held in South Wingfield on June 10 2017 featured excerpts from a local musical ‘The Last Revolution’ which was performed in full at Markeaton Park in June 2017. We were pleased to welcome descendants of the Pentrich revolutionaries from the United Kingdom, Canada the USA and Australia. Further events have been held in Pentrich in June 2018 and once again in South Wingfield in November 2018. We were pleased to have a performance by John Young of William Turner’s Tale at both of these events. With Front Row Films we have produced two short films about the Pentrich Revolution both of which are available on YouTube. There is also a recording of John Young performing William Turner’s Tale. They can also be found via a link on our extensive website www.pentrichrevolution.org.uk . In addition, we have produced comprehensive Education Resources for primary and secondary schools. These can also be found on our website and will be distributed to local schools in due course. Fantastic afternoon very much enjoyed reading about the history well done to all and everyone involved in getting this together. Great day - and we even met some Australian relatives! Congratulations to everyone - a great day from the Pentrich to South Wingfield walk, to the musical, to the Morris Dancers, the exhibitions and the spirit of the coming together of families - it was all amazing. A great day - hope we did them proud. Thank you for a great 200th and for making our democracy movement a source of pride!! A fantastic day we will always treasure. Well done! Hello Everyone, six bellringers from the Derby Diocesan Association of Church Bellringers rang two Quarter Peals this morning to commemorate the bicentenary of the Pentrich Revolution, the first at St Matthew's in Pentrich (10am start) and the second at All Saints in South Wingfield (11:30am start). The ringing was of a high standard and we are proud to have been part of the commemoration. You did a brilliant job and should be very proud of all of the hard work and research that you have all put in. Enjoyed all of the events I attended especially the walks. You have definitely raised the profile of the Pentrich Revolution, including in Australia. Congratulations on wonderful work! Very interesting as no previous knowledge of the happenings in the revolution. Such an amazing story that needs to be told to the world. A really good presentation and wonderful countryside. Looking forward to learning more when I go to see the film about the Revolution at Belper a week on Saturday. I’ve got to know a lot more since following the website. I used to enjoy reading the Spider diaries, have they finished? My only regret is not visiting Pentrich before I retired to Spain 16 years ago. But keep up the interesting work and thank you for everything you do. An enjoyable afternoon, thanks to all who organised it. Impressed by leader’s knowledge. Surprised by the extent of repression that followed the revolution. 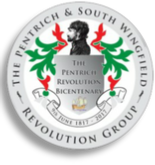 Click here for details of our conference Pentrich to Peterloo. Click here for Photos from our conference Pentrich to Peterloo.